The JML Hardware Pillsafe is intended for use in nursing and residential care homes, hospitals and schools as a means of safe storage for medicines. The cabinet is manufactured from 1.2mm thick mild steel, and is attractively powder painted white for added durability. 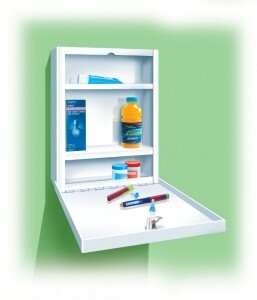 There are two adjustable shelves within the unit and the door opens downwards to form a useful dispensing surface. A 316 stainless steel piano hinge has been added for extra security and strength. The Pillsafe is easily and securely fitted to a flat surface by means of four fixing holes. Only basic DIY skills are necessary! For more details please click the pdf, alternatively contact Stuart or Phil on 01942 715678, who will be able to answer any questions you may have. This item and many more are available in our online shop, see the categories to the right, the direct link below or click ‘Shop’ at the top of the web site.